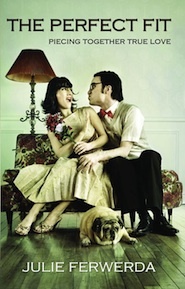 For Singles: The Perfect Fit: piecing together true love. Do you wonder if there are second chances after divorce or broken relationships? Does pure, lasting romance really exist? Do you want to believe God can fix any mess you’ve made and bring a fulfilling, purposeful plan into your life? If you answered, “YES!” to any of these questions, then this book is for you. No matter what mistakes have been made in the past, singles can find renewed hope for romance God’s way as they learn now God can take the broken and jumbled pieces of your life, and fit them into a beautiful Master-Piece. This inspirational narrative weaves a true-to-life romance with biblical instruction and a heavy dose of humor. 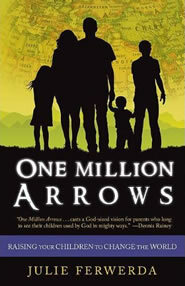 For Parents: One Million Arrows: Raising Your Children to Change the World . Will the world change your children…or will your children change the world? Time is short and lives are at stake. Right now, God is inviting your family to become part of a bigger story—a vision that will engage your hearts to make a radical difference. OMA is an inspirational call to raise your kids to impact their culture, community, and world for Christ. If you want your kids to discover their purpose, if you want them to live with a passion for the Kingdom, if you want your family to go down in His-Story, accept the mission…and leave a mark for eternity. **All profits from this book will go to international orphan care and ministry. Visit our website . 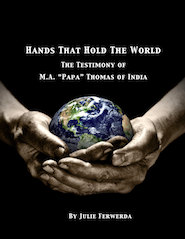 For Revolutionaries: Hands that Hold the World: the testimony of Dr. M.A. “Papa” Thomas of India. If you love biographies of the heroes of the faith, this one will not disappoint! “Papa” has literally changed the world through his love and God-given vision for children. Read this moving memoir and you will undoubtedly be changed for life. Best of all, this book is free and available for download .